There’s a delicious County Employees’ Charitable Organization announcement. The 2017 CECO Bake-Off champion is Donatella Aguinaldo! Her fresh mango cheesecake cupcake beat out the competition of other cakes, cookies, cobblers and other confections earlier this month during the annual fundraiser. 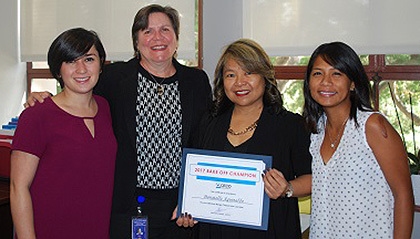 Aguinaldo, a Departmental Payroll Specialist with the Department of Animal Services, is an avid baker that likes to whip up both sweet and savory treats in her kitchen. She said her cupcake is a favorite with friends and family. If you missed the bake sale, no-knead to worry. You can still give to CECO. Here’s how to get involved.